Over 4,000 people are diagnosed with new cases of brain or central nervous system (CNS) cancer every year in the UK. 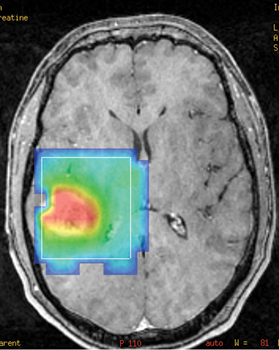 Glioblastomas are the most common and aggressive form of brain tumour in adults. Research at the Cambridge Cancer Centre is focused on understanding the different types of brain tumours that develop in both adults and children, finding the most effective ways of diagnosing brain tumours as early as possible, developing new treatments, and monitoring how tumours are responding to treatment. The Cambridge Cancer Centre is coordinating a number of clinical trials for adults and children with cancer of the brain or spinal cord. One of these trials is testing a new tool to help surgeons remove as much of brain tumour as possible and potentially improve the survival rates of patients. Patients with glioblastoma are given a drink containing a dye before their operation, which makes. The dye makes the tumour cells glow pink under ultra-violet light. This allows the surgeon to distinguish tumour from normal brain allowing more tumour to be removed while improving patient safety so during surgery the surgeon can see the tumour cells more clearly and remove as much of the tumour as possible. Discs with a drug that kills tumour cells are then implanted in the space left after the tumour has been removed, to target any tumour cells left behind. We have recently developed a real-time multiple sampling scheme to interrogate high-grade glioma during surgery. FGMS (Fluorescence-Guided Multiple Sampling) is based on fluorescence-guided resection technology to obtain spatially distinct tumour biopsies from individual tumours in real time, during cytoreductive surgery. Figure 1.1 We can use these data to dissect intra-tumour heterogeneity, identify clonal diversity and infer tumour evolution. Figure 1.2 Reconstruction of GB progression in time and space: The combination of sampling information (A), reconstructed tumor phylogeny (B), gene expression profiles, and molecular clock data enables temporal and spatial reconstruction of tumor ontogeny (C). Little is known about the impact of intra-tumour heterogeneity on tumour evolution, growth and the consequences of such heterogeneity on the emergence of resistant disease. This is an important problem in brain tumour research because it is the emergence of recurrent treatment-resistant disease that kills patients and it is variability in this biological process that is responsible for variation between individual patients.